The next morning, Lucan Midorichal announced that he planned to stay at the Burburan Oasis until after the autumnal equinox celebration coming up in a couple days, then return to Zahallan. At that time, the PCs' current contract will end. Fatou showed Sulma the stone disk they had found, and the halfling named a price to translate it. Jumari agreed, and paid her. Sulma told them that the writing on the front was the names of the four elemental gods, transliterated into Giant from the elemental tongues: Sakutima, the air god; Nyonaposh, the earth god; Shapeto, the fire goddess; and Lapekai, the water goddess. The two lines of script carved onto the back read, "Costheus, Nikaos of the Varfur." Sulma explained that "Varfur" is the name that the desert giants give themselves, while "Nikaos" is a minor noble title. Fatou then took back the disk and moved to another table, while the other continued to talk with Sulma. Lucretia followed Fatou, who told her that the four elemental gods were named Chazital (air), Genesib (earth), Lutoran (fire), and Talusoka (water) in Common. The Thovalan half-elf recognized those names from her religious studies, because the Sword Islands, her empire's main rival, worship them under those names. Meanwhile, Jubair asked what they could expect if they were to try to return the disk to the giants. Sulma said that the dead giant's people would definitely want it back. She confirmed what they had heard earlier that this version of the Medan holy symbol was associated with the ruined city of Tibul. Sulma desires to see that city for herself someday, but it's rumored to be haunted and cursed--though she did not know any details yet. It is also too close to the Shalash Escarpment (and its resident orc tribes) for comfort, and the Diggers are not powerful enough to deal with any giants that might dwell there. 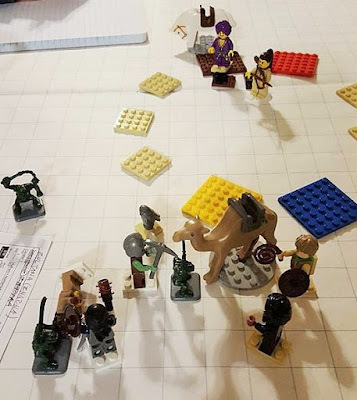 The party asked the scholar what she knew about giants in the desert. Sulma knew that cyclopes dwell in the desert, and once saw one at a great distance. They are usually evil, but the desert giants are not--they're merely prickly about their privacy. When she asked where the party had found the disk, Jumari answered truthfully, but was vague about the location. Sulma said that she had seen other ruins in the desert that were definitely giantish in make, but could not say for certain whether they were connected to Tibul in any way. The PCs had learned what they wanted to, so thanked Sulma and took their leave. Fatou approached to thank her and added a small tip to the fee, as a sort of apology for her rude departure. When the party was alone again, Jubair suggested that they try to team up with Allara's Diggers to go investigate Tibul. None of his companions jumped at the suggestion, but will keep it in mind for after they finish their current job. Two days later was the autumnal equinox. The PCs spent the intervening time helping Midorichal prepare for the return trip to Zahallan and learning more about the upcoming festivities. Lucretia, being a foreign monk, had many questions for Fatou, who was her only companion with significant education about the dominant local religion. Jumari, on the other hand, stayed near the caravanserai and avoided the festivities for the most part. On the day of the equinox, many of the PCs participated in contests that were being held as part of the celebration. They also saw some of the Diggers competing as well, and the rest of that company were among the spectators. ZhaZha entered the camel races, and came in second, winning a small cash prize. Lucretia competed in the archery trials, but did not do well enough to place. The next day was spent recovering from the revelry and making final preparations for the next leg of the journey. Camp in the desert: 4x4 plates are halfling-sized tents (NPC guides/drovers); 8x8 plates are human-sized, for the caravan boss (brown) and PCs. Not shown: halflings, ponies, pack mules. During Jumari and Jubair's watch on the caravan's second night in the desert, a small band of orcs attacked the campsite. The two PCs saw them before they reached the tents, and the rogue bellowed out a warning to the camp as he engaged the leader. The half-orc inquisitor joined him to provide flanking, allowing the rogue to swiftly cut down the orc. However, other orcs soon arrived, and Jubair fell beneath their blades. 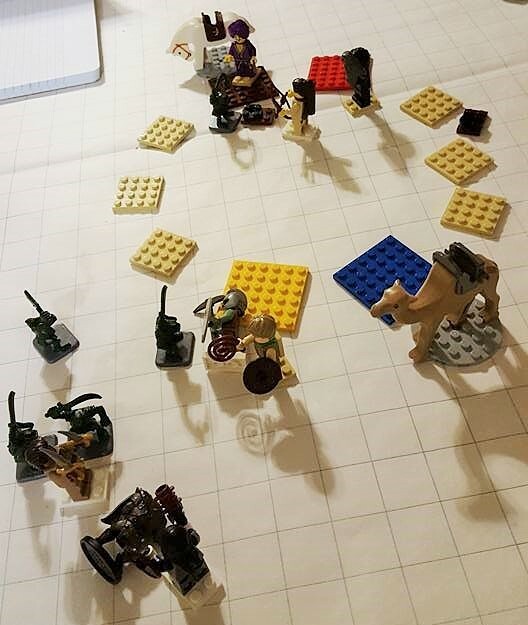 The two NPC halfling drovers who shared the midnight watch ran to spread the alarm and protect the animals picketed around the campsite. Edel and ZhaZha emerged from their tents and engaged the nearest orcs--the bard with his scorpion whip, the cavalier with her pick. ZhaZha suffered a hard blow and fell, but luckily Edel and Jumari were able to heal their allies and get them back into the fray. Meanwhile, Lucretia and Fatou had emerged from their tent to discover an orc fighting one of the halfling drovers just outside their boss's tent. Lucretia shot arrows at it while Fatou fired force bolts and Midorichal sniped with a crossbow from within the cover of his tent. With that orc wounded, Fatou went to help her other friends, whose calls for help were growing more urgent. Unluckily for Jubair, he took another hit before he could get to his feet and was knocked out again. Jumari used her intimidating appearance to good effect to frighten one of the orcs responsible, who promptly withdrew, then fled. Once Lucretia finished off her orc, the monk and wizard's missiles helped turn the tide on the other side of the battle, and Fatou's owl familiar got in a lucky hit to drop one of the staggered orcs. ZhaZha managed to stand safely, and called for her camel to attack her foes. With one of the orcs now flanked, the cavalier was able to land a gruesome critical blow that impaled her foe's skull upon her pick. Jubair (left) goes down, but a healed ZhaZha calls for her camel mount and crits on an orc with her pick. Jumari (by Jubair) has demoralized one orc, who withdrew (but did not escape). Jumari had taken a hard blow herself, but her healing judgment saved her from losing consciousness as she continued fighting. She touched the remaining orc with her hand, which opened a gushing wound that instantly killed him. ZhaZha mounted her camel to chase the fleeing orc. However, he was brought down by missiles just before she reached him. Once the orcs were all dead, the PCs were able to tend their wounds and make sure that Jubair was stable. They also searched and stripped the dead orcs of their arms and armor, for use or sale later. In the morning, Midorichal gave the wounded characters lighter duties so that the healers could revive Jubair and help the others recover a little more. The merchant still got the caravan moving at a fairly early hour, in the hopes of getting well clear of this location and any further trouble their battle might attract. The sooner they reach Zahallan, the happier every one in the company will be. A race almost won by our cavalier. While others of us sparred to no avail. Joined in to block this craven elf from strife. Before the winning strategy was found. We bound our wounds and set out once again. The elf bard reveres the faerie goddess of the spring, so spending the autumnal equinox in the desert made him rather lonely and homesick. The orcs proved difficult to slay due to their ferocity ability--they could continue to fight even while dying, but were staggered and continued to lose hit points while they did so. However, a single hit from one of their falchions could drop a 1st-level character to negative hit points. I ret-conned away an attack of opportunity that hit ZhaZha for a crit that nearly killed her, because I remembered--mistakenly--that staggered characters couldn't make such attacks. 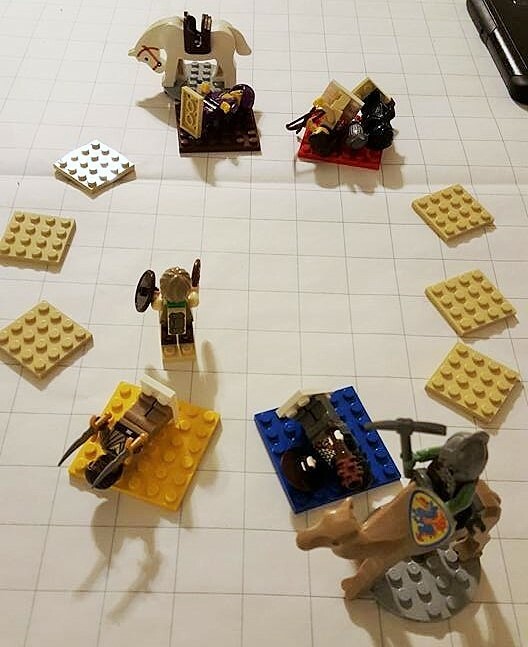 Checking after the session, though, I found that they can still take immediate actions, which I will need to remind my players about next time. It's just as well that I took back that hit, though, because ZhaZha would have likely bled out the next round if a healer didn't get to her that same round. I should also have pointed out earlier that Jubair and ZhaZha could opt to fight defensively or take full defense, which would make it easier for them to survive until it was safe to stand up again--something my Pathfinder Society rogue learned the hard way just a couple weeks ago. ZhaZha's player deliberately chose a x4 crit weapon, and it has paid off. 35 hit points is pretty darn impressive for a 1st level character! This was her bleeding touch domain power, and its effects are rather creepy--though not nearly so dramatic as ZhaZha's crit was!